Version 9.1.2 will introduce the ARRAYRANK feature. Here is a preview of its capabilities. The ARRAYRANK built-in can be very powerful for some applications. It allows you to order the values in an array from smallest to largest or vice-versa. In this sense, it expands upon what ARRAYMINIDX (find the index of the smallest value) and ARRAYMAXIDX (find the index of the largest value) already do. Note, however, that sales ranks does not contain the desired salesperson ranks themselves, which we need to calculate the commissions. E.g., it does not tell us that the first salesperson is ranked 3rd. Rather, it contains the indices of the ranked sales figures. 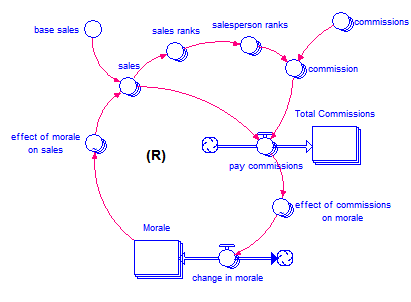 If we examine ARRAYVALUE(sales[*], sales_ranks), we will get the smallest sales figure. How can we get the salesperson ranks? Let’s examine this in more detail. Imagine the sales figures are 2000, 4000, 5000, 3000. ARRAYRANK on this dataset will return 1, 4, 2, 3. Using these numbers, we can easily extract the sales figures in ranked order. But what we really want is the sequence 4, 2, 1, 3. This sequence tells us that salesperson one had the 4th highest sales, salesperson two had the 2nd highest sales, salesperson three had the highest sales, and salesperson four had the 3rd highest sales. This allows us to directly extract the commission percentage. To convert the rankings of sales back to the rankings of the salespersons, we only have to sort the sales rankings. That is what the equation for salesperson ranks does. Since we also want the highest, rather than the lowest, sales figure to be ranked one, we do the sort in descending order. Instead of using ARRAYIDX() for the desired rank, this equation uses DIMSIZE() – ARRAYIDX() + 1, which reverses the rankings. While ARRAYIDX() counts from one to DIMSIZE() as the array index increases, DIMSIZE() – ARRAYIDX() + 1 counts down from DIMSIZE() to one, reversing the ranks. Finally, the commission is directly extracted from a table of commissions (stored in an array) using ARRAYVALUE and the salesperson rank. 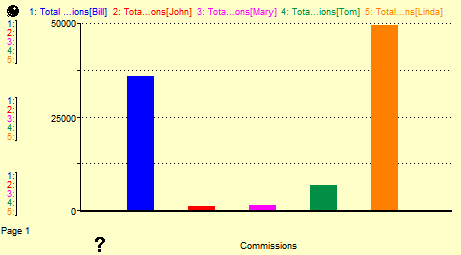 Note that the array commissions has as many entries as there are salespersons, starts with the highest commission (0.20), and ends with the lowest (0.05).